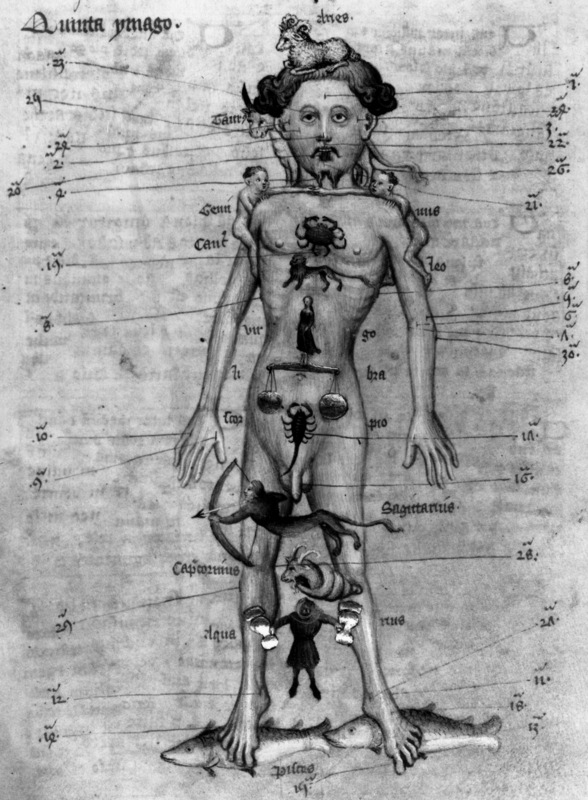 An image of a 'zodiac man', showing the parts of the body governed by the various signs of the zodiac. Astrology - belief in the physical influence of planetary rays on earth - is one of the most important historical contexts in which astronomy developed. Astrology served as a motivation as well as a means of gainful employment for astronomers. The Babylonians meticulously compiled tablets of the position of Venus, as it was believed to signify omens for weather, war, famine, diseases, rulers and kingdoms. Ptolemy composed the Tetrabiblos, believing that astrology could be placed on a rational footing, despite being a conjectural art like medicine. In practice, belief in astrology meant that horoscopes were cast for new-born children, prospective spouses and political enemies, public buildings were opened and marriage and other ceremonies conducted on auspicious days. Numerous records of astrological practice can be found from the Roman times. Several important Arabic authors on astronomy, such as al-Kindi, Masha'allah and Abu Ma 'Shar were astrologers: Abraham ibn Ezra and Ibn Yunus discussed astrology in a scholarly manner. In the Latin West, the terms astrology and astronomy were interchangeable for a long time. In the arts faculties of medieval universities, the theory of planetary motion of Sacrobosco, Ptolemy and Gerard of Cremona (later Georg Peurbach) was always taught alongside guides for interpreting the influence of planetary configurations, through texts such as Alchabitius' Introduction to Astrology, Ptolemy's Tetrabiblos and Centiloquium and Albumazar's Great Conjunctions. Johannes Kepler believed that he could set astrology onto a surer footing, and his astrological beliefs were fundamental to his heliocentric cosmology. 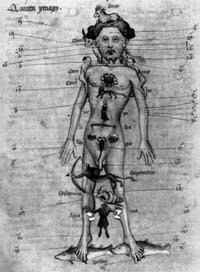 It is important to remember that one of the important reasons for studying astrology in the Latin West was medicine: parts of medical prognosis and treatment were determined by astrological information. For instance, whether a disease 'turned' (on 'critical days') better or worse depended on the state of the patient's body and whether it was an astrologically favourable moment. Bloodletting, a medical treatment intended to rectify the imbalance of bodily humours, was regulated by the position of the moon, which was considered to exert greatest influence over the human body. For instance, every sign of the zodiac was considered to rule a part of the human body: the Saggitarius ruled the thighs, Pisces the feet, and so on. When the moon was in the zodiac ruling a particular part of the body, bloodletting from that part was to be avoided, since the attraction of the moon might cause excessive bleeding. Numerous medical manuscripts and almanacs include the figure of the 'zodiac man' as a reminder of the specific influence of the moon. In addition, the power of the moon's pulling power varied by its phases, and thus almanacs usually showed the phases of the moon. Thus, students of medicine at Bologna, for instance, learnt astrology for four years, including grounding in Euclid's geometry and Ptolemy's Almagest. In addition, they learnt how to use instruments such as the astrolabe and the quadrant, and were taught how to use the Alfonsine Tables along with their canons. The instruction to use astronomical tables indicates that students, or future practitioners of medicine were not expected to calculate afresh planetary positions each time they needed to make a prognosis or conduct blood-letting. Several manuscripts for physicians contain short-cut tables or volvelles (paper discs) in order to establishing planetary positions and phases of the moon. More frequently, practitioners relied on calendars which listed the necessary astrological information. Thus mathematics professors at Bologna were required to compile the official prognostication in order to ensure the dissemination of proper and accurate astrological knowledge. The need for some mastery in astrology for the study of medicine explains why so many teachers of mathematics or astronomy had medical degrees or went on to become physicians, including the most famous astrologer of the Early Modern period, Nostrodamus. The works of Copernicus and Regiomontanus, and contemporary expectations and reactions to them, also needs to be understood in this light: developments in astronomy were inextricably linked with, and were believed to have, implications for astrology. Astronomical developments did not necessarily mean the demise of astrology. Outside the university walls, the belief in planetary powers was wide-spread enough that rulers retained their own court astrologers. Frederick II (1194-1250) employed Michael Scot, Federigo da Montefeltro (Duke: 1468-82) Paul of Middelburg, and Rudolf II Tycho Brahe and Johannes Kepler in succession. Galileo Galilei, as courtier was also expected to meet the astrological needs of the prince. Tracts and pamphlets came to be written, blaming astrological configurations for social upheavals or diseases, such as the Black Death, the Sack of Rome, the Peasants' War, the split of the Church, outbreak of syphilis. Prognostications in the vernacular flooded sixteenth-century Europe, foretelling terrible weather, major floods, political unrest and the coming of the Anti-Christ. Comets were eagerly studied as signs portending disaster. Novelties in the heavens were scrutinised for their influences and meanings on earthly matters. Belief in the power of the heavens became part of a world-view; poems were written and metaphors developed in the works of Chaucer, Shakespeare and Milton, to name only the most famous. The supreme and central power of the sun was successfully employed as an image of kingship by the advisors to Louis XIV, the 'Sun-King'. It should also be remembered there were many who objected to astrology in one way or another. The profusion of astrologers, their practice of divination and forecasting the future alarmed Christians as well as Muslims, who saw them as implying a deterministic world-view in which God would loose his omnipotence and humans their free will. Constantine thus made divination a capital offence in 357, a ban repeated in 373 and 409; Augustine spoke out vociferously against it in his City of God. Avicenna, Al-Farabi and Averroes all objected to certain astrological practices. Important critiques of astrology in the Latin West included Nicole Oresme, Thomas Bradwardine, Giovanni Pico della Mirandola, and Martin Luther. In 1586, Gregory XIII issued a Bull against astrologers, confirming existing prohibitions against predictions of fortuitous events or events depending on human will. However, predictions based on nature and of use to medicine, agriculture and navigation were still permitted.